Children seem to be getting braces earlier and earlier. A couple of decades ago, dental professionals preferred to wait until a child’s adult teeth had grown in before placing braces, meaning most kids that needed braces had them on as teens. However, now dentists are finding that placing them earlier helps to shape the teeth as they come in, giving a straighter smile. If your kid needs braces, you will want to talk to their dental professional or orthodontist about when the braces should be placed. However, here are a few of the signs that your child is ready for braces. While you do not have to wait for the adult teeth to grow in, most dentists and orthodontists prefer to wait for the majority of baby teeth to fall out. If your child has lost all but one or two of their baby teeth, it may be time to think about braces. If you suspect your child will need braces, you may want to start consulting with an orthodontist as soon as the first adult teeth begin to come in. 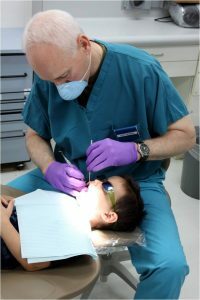 They can then monitor the loss of your child’s baby teeth and tell you which ones need to fall out in order for them to feel comfortable placing the braces on your child’s teeth. Most children’s 12 year molars begin to slowly erupt or come in anywhere from 10 to 13 years of age. Most orthodontists prefer to wait to place braces on a child’s teeth until the molars are at least partially erupted. The reason for this is that the molars may be closer to other teeth or larger than expected, which can push on teeth in the mouth. If there are gaps, the molars pushing on teeth can start to fill in these gaps naturally. If braces were already placed, overcrowding can occur or teeth can shift in ways they should not. As such, it is important to wait until the molars are erupting before braces are put into place. The last sign that your child is ready for braces are abnormalities that put the adult teeth at risk of being damaged. If your child’s teeth are severely crowding, crossed or they have a drastic overbite, braces may be placed as early as seven years of age to prevent damage to permanent adult teeth. However, if your child falls into this category, be advised that they may wind up wearing braces for a long period of time or need them on at two different points in their life. Starting this treatment early only is done to prevent problems that can cause the adult teeth to become damaged. If your dentist has told you that your child will need braces, you should consult with an orthodontist as soon as possible. Even if they are not able to place the braces, they can give you signs as to when they should return. This will help you to place this treatment at the appropriate time in your child’s life. Learn more about braces and the process of getting braces by contacting our dentist in Coconut Creek FL!